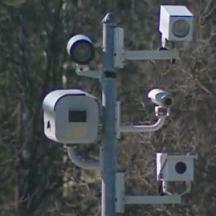 An audit of the Maryland State Highway Administration by the Maryland Department of Legislative Services found that there were significant flaws in the implementation of Maryland SafeZones speed camera program, in the way the program's contract was bid and how equipment certified and tested. 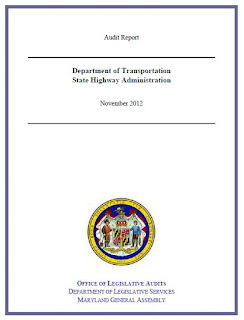 The DLS report found that "SHA awarded a contract for operating the current Maryland SafeZones Program, even though the contractor’s proposal was not in compliance with certain RFP requirements"
"Prior to awarding the contract, SHA used a consulting firm to conduct a system accuracy test of the contractor’s proposed equipment in an active highway work zone. However, the consulting firm deviated from SHA’s testing instructions and therefore, the basis for the conclusion that the equipment met performance requirements is questionable. For example, SHA directed the consulting firm to have test vehicles perform 40 test runs in which the contractor’s speed measuring equipment would be compared to two independent radars, one which was inside and one which was outside the vehicle. However, the consulting firm only conducted 18 test runs and only reported the results of 8 of those runs. Moreover, five of those eight reported runs were made using vehicles lacking independent interior radar, so the results could only be measured against one independent radar, rather than two as planned. Nevertheless, the consulting firm stated that the observed results fell within acceptable standards, and SHA’s technical evaluation team gave an overall “good” ranking of the contractor for the applicable bid evaluation attribute. SHA could not provide a reasonable explanation or documentation regarding why the tests were considered sufficient." "The automated speed monitoring systems did not undergo a calibration check by an independent calibration laboratory until nine months after implementation. State law, and the contract, require that a work zone speed control system undergo an annual calibration check performed by an independent calibration laboratory, and the law further provides that those results shall be admitted as evidence in any court proceeding for a related violation (speeding citation). The intent of this calibration check is to ensure that the equipment functioned in accordance with the manufacturer’s specifications. The process of obtaining independent calibration certifications began on March 31, 2011, nine months after the contract’s July 2010 inception and after our inquiries." "SHA’s position is that neither State law nor the contract specified the timing of the annual independent certifications and, consequently, the certifications obtained beginning in March 2011 satisfied any legal or statutory requirements." We probably don't need to explain to the more cynical among you that this is basically like saying you can drive for the first year without a license. This is a perfect example of a typical bait and switch where the government promises there will be protections under the law for motorists, and then interprets those protections out of existence.... we've seen it before. For those of you who have been following our site for some time, this probably sounds strangely familiar. That's because StopBigBrotherMD was first to report on this issue back in February of 2011. We later learned that speed cameras run by Baltimore County and Baltimore City shared the same problem at the time -- the same contractor (ACS/Xerox) had their devices certified by the manufacturer rather than an independent lab. So basically, the matter was only corrected after WE reported it. You're welcome. "SHA did not ensure that performance benchmarks were established for the Maryland SafeZones pilot program as allowed by the contract. Specifically, SHA’s contract for the pilot program called for benchmarks to be established to evaluate contractor performance; however, no benchmarks were established even though the contract required the contractor to provide a speed monitoring system capable of accurately measuring speeds and collecting readable license plates in various environmental and operational conditions." The report also noted that the SHA needed to reject a vast number of citations: "only 44 percent of those violations photographed were actually issued a citation because the remaining 56 percent were deemed unacceptable by SHA due to reliability and readability issues."